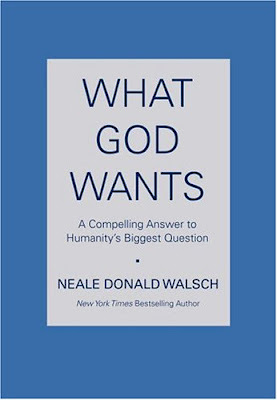 Since you have finished reading the book..my question is what does God want? Can this book written by a man give us insights into the mind of God?? It's like a 2D object trying to get into the mind of a 3D object. Re. previous comment, I totally agree! That's one man's view...and it's not necessarily true. God's Word, what he wants is in the Bible...and even that is subject to man's own interpretation! What does God want? Well, He does say somewhere, "Love one another as I have loved you." And Jesus says the greatest commandment is to love God and to love your enemy as yourself. I tend to agree with MBL and STP. What would man know what God wants? No offence to anyone but aetheists think that the Bible could have been written by some genius (of story-telling) while scientists believe in evolution. I think it's a fascinating & thought provoking book. The title immediately grabs my attention. I agree that we need to zoom out, and observe from the outside. Without the parameters set by religion to understand better. my bug life, I knew the answer but would spoilt it for readers if I were to reveal it here. Just get the book and read it. This book may be written by a man but it is brilliantly written and very inspiring. suituapui, yes it may be one man's view, and you don't have to believe everything it says but yet you will find the book an inspiring and even enlightening. In fact the book asks you not to believe everything you read including what is written in the book itself, but to find your own truths. happysurfer, it's true what you said, but this book will provide you a different perspective that will open up your mind. It neither side with the Bible nor science. You read a lot of books. You are knowledgable le..
What's in Chapter 13 Foong? Care to share? I think no one really knows what God wants. People may like to think that they know but how can they be sure it really IS what HE wants? Each religion has it's own beliefs and what each person thinks what God wants depends on what that belief is. "...In fact the book asks you not to believe everything you read including what is written in the book itself, but to find your own truths..." And with that, I absolutely agree. I guess in life, if we always do good, then we can do no wrong! they this book is like an answer to the meaning of life? What did you think of it? I am always nervous when people try to say what God wants. Interesting and would love to know your take. I agree with Foong about this book. It is not the matter of you "playing God" by reading God's mind but it is the matter on how you look at the bleeding world. Sometimes we might think that is what really God wants but is that really what God's want? The previous is one way perception don't you think MBL and STP? It can be many ways of solutions but still so many ways to figure out. This is a book which I must read next. Thanks for sharing. I am thinking of buying Conversation with God too. Great review. hmmmm.... this makes me more curious to get the book. I have read Conversations With God (Book 1-3) but I didn't know about this book! I will definitely check it up and buy it. Thanks for tipping and writing about it, Fongpc!! I've heard of this book but never bought it, what God wants should be quite clear in the bible, but anyway will keep an eye out for it next time I visit Salvation. BTW Happy Belated Bday! May u receive abundant blessings from the Lord over the coming year! "It's a good read even if you don't care about the after life, because it's actually how we live our lives now that really matters." ...and shouldn't we live our lives doing as much good as we can, never mind what's going to happen after we're dead and gone? I don't think we should do good with ulterior motives - just because we want to go to heaven or we don't want to be reincarnated as a pig! We do good because it is good to do so...for humanity.